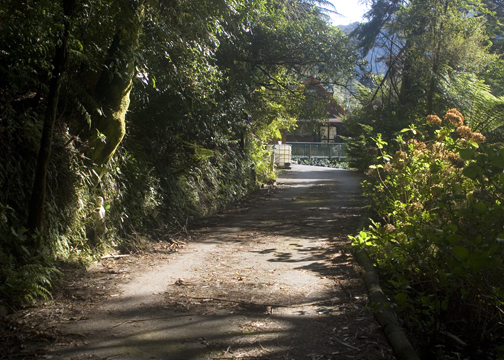 At the end of a leafy driveway, lined with little white pastoral statues, was the Crystal Waters Fish Farm. It was easy to see why my friend Amit had fallen in love with his piece of land. His property sat in a narrow valley, surrounded by forests and bisected by gurgling streams. There were landscaped gardens, hidden fountains and even a large wooden suspension bridge to link both halves of his land, and this was just the residential section. Across his stream was the commercial half of the land- where tanks and sheds filled with more tanks were used for breeding and growing. 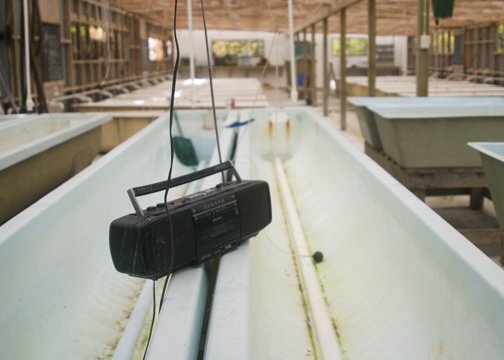 The golden days of hatching goldfish had gone and aside from empty containers, all that remained was a radio and a wall of stiff black bristles. It might not have looked like much, but it was just the foundation Amit needed for his future plans. Walking back to the house, we passed a sunlit hill with sheep grazing on top. “Actually, I’d like to show that part of the property,” Amit decided. We changed course and as we crested the top of the hill, a little lamb came into view. 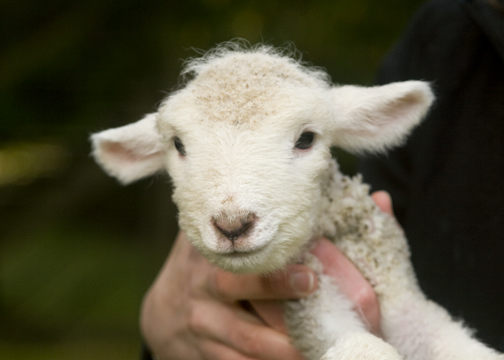 I definitely wanted to squeeze one of those little tufts of wool till its hooves popped off. We stealthily moved into formation, held our arms out to appear larger, and closed in on the sheep. Sensing our approach, they ran down the hill as our circle tightened. I dashed to the right, perhaps too fast, and the sheep became more spooked. They cut between us and looped around a small pond. We changed tactic and repositioned. Once again the sheep were heading in the intended direction. Right before they entered their paddock though, they made a desperate last dash through the knee-deep bush. All but the littlest lamb had gotten away. It bleated mournfully as it futilely tried to hop the shrub. Amit, thinking he could use the lamb to bait the others, called out to the nearest person. From my perch on the hill I saw Barret pause. He looked over at the lamb and glanced behind him to the herd of sheep. The mother, having realized her baby was stranded, began calling out imperative bleats. The calls were intended for the lamb but they had an unnerving effect on Barret, who believed a stampede was eminent. I never thought a tiny lamb could terrify the same man who chased a purse snatcher down a dark street in Uruguay, but it had. Amit obligingly picked up the lamb himself and when I reached the base of the hill, I grabbed its furry little body for photo ops. Amit still had a surprise for us before we left. 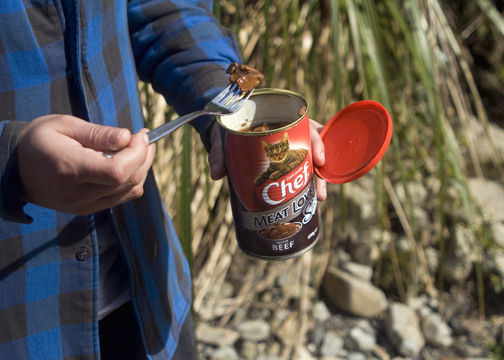 He went to ‘get something important’ and reappeared with a can of cat food in one hand and a fork in the other. “Are you ready?” He asked, enjoying the puzzled expression on our faces. We followed him out onto an exposed rocky area next to a stream. He scooped up a little cat food and placed the fork and bait just below the water. Several minutes passed before we saw a dark shadow move under the rippling surface. A long black eel slowly advanced and, reaching the cat food, engulfed the fork in its mouth. 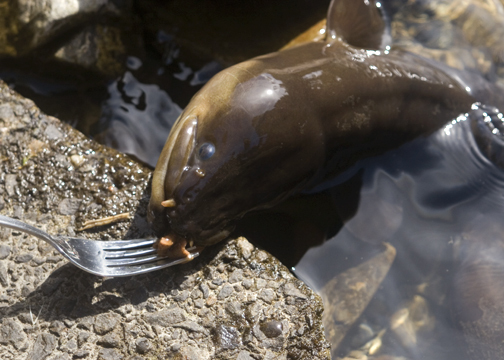 Amit loosened the fork from the eel’s grip and handed it to Barret, who grabbed it with a steady determination. Barret thrust it into the can and disgorged the biggest lump of wet cat food I have ever seen. Then, with lightning fast reflexes, he plunged the bait into the frigid water. He soon had the eels attention and dexterously coaxed it out from mysterious depths. With the eel distracted, Barret jabbed a finger into the slick, spongy body (or maybe it was still its neck) and claimed it conquered. Thank god my manly man had returned.